IP to QAM (DVB-C) Modulator, with up to 1024 IPTV in, with Multiplexer, with 16 RF and 16 MPTS IP out. ⟩⟩⟩ 5. 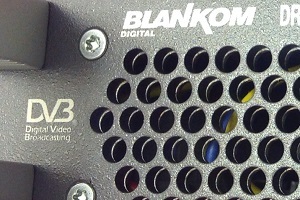 Generation BLANKOM® Hybrid DVB & IPTV Headend Technology. IPTV input, DVB-C and IPTV output with multiplexer and scrambler. The IPTV input channels can be SPTS or MPTS, unicast or multicast. The internal multiplexer creates 16 streams with any combination of content. The output consists of 16 DVB-C carriers within 192 MHz bandwidth, each with up to 256QAM modulation. Each of the 16 output multiplexes are also provided as MPTS IPTV streams, UDP/RTP/RTSP, unicast or multicast at the both data ports. BLANKOM HDC-5016 modulates up to 1024 SPTS or MPTS IPTV channels into 16 QAM (DVB-C) carriers within 192 MHz bandwidth, in broadcast quality. 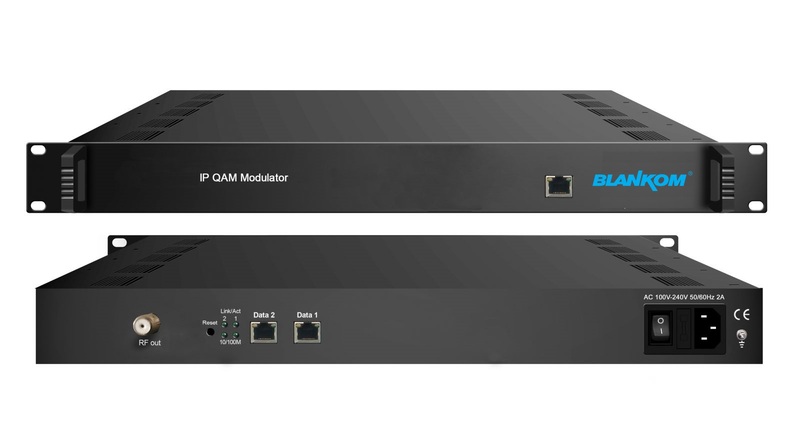 BLANKOM HDC 5016 is an IP to QAM modulator with internal multiplexer and scrambler. Up to 1024 IPTV challes can be multiplexed and modulated into 16 DVB-C channels. The RF frequencies are configurable. It has also MPTS stream output of the multiplexed channels. Thus it can beused as SPTS in MPTS out IPTV Multiplexer. The unit can be controlled remotely through web, with any web browser.